Vegan MOFO: F is for FUN! Day 6 of Vegan MOFO at Don’t Fear The Vegan and though a bit tired I am so happy I took part in this. Via comments and the few blogs I have had the chance to check out I have met some amazing bloggers. I look forward to tomorrow because I will finally have the opportunity to sit and read others posts! While I was working out what to do for each letter of the alphabet I requested the help of my family. My daughter was adamant that F was for fun. The blog has been a family project from day one and I could tell this was very important to the little one so I decided to go with it. As a child I loved helping my parents in the kitchen. As an adult I enjoy my daughter helping me cook even more. In order to get her interested the recipes need to be interesting and fun. She loves whisking, using the food processor, measuring, rolling dough and using cookie cutters. For this recipe I was able to incorporate four of her five favorites so she was pretty content. The fact that she was able to snack on the grated cheese was a bonus. So from the A is for Agar post I had a lot of left over cheese to use so I went searching for an idea to use it for. In my quest I came across a non vegan version of homemade Goldfish crackers at Smitten Kitchen. It reminded me of how much I use to love those and decided that would be the recipe I would veganize to use up my cheese. 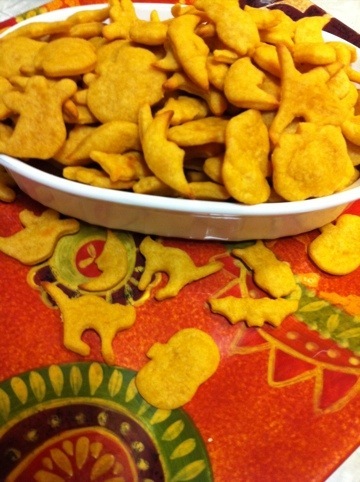 We opted for Halloween cookie cutters so we could serve them at the kids costume dance party this weekend. 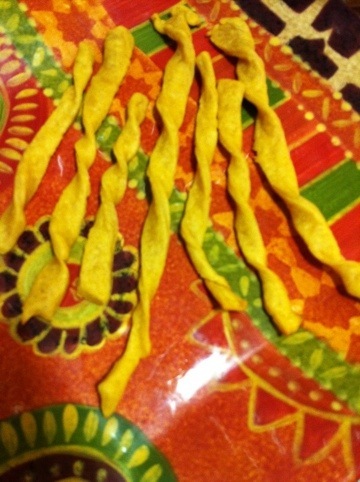 Unfortunately, they came out so good I don’t see them lasting the next twenty-four hours. We lost count after 250 crackers. With the last bit of dough we decided to make cheesy twist which were amazing and would be a great accompaniment for soup or with dips this holiday season. I am more excited about this recipe than I have been about any in a long time. Definitely recreated something I loved in my childhood to experience with my daughter. We had a lot of fun!! In a food processor with a dough blade mix all ingredients. Blend until it forms a ball and the bowl is clean. It took about three minutes. Put dough in a bowl dusted with flour and refrigerate for 45 minutes. Preheat oven to 350 degrees. Line cookie sheets with parchment paper. Flour counter surface and using half the dough (keep the other half refrigerated until ready to use) and roll it until it’s 1/8″ thick. Cut out and place on cookie sheets. Bake for 10 – 12 minutes until golden brown. Place cookie sheet on cooling rack. Eat hot or cold. We lost count at 232, but I am pretty sure we made close to 300 not counting the cheese sticks. 4 Responses to Vegan MOFO: F is for FUN! It’s so nice that your blog is a family project, my family don’t even read my blog, well…my dad does sometimes but he was a bit taken aback by my rude tag line lol. These crackers look great, I made some cheesy crackers a while back….hmmmm….they might just make an appearance over the next few weeks. These crackers look so good. I’ve bought the one brand of vegan cheezy crackers (Eco-Planet?) 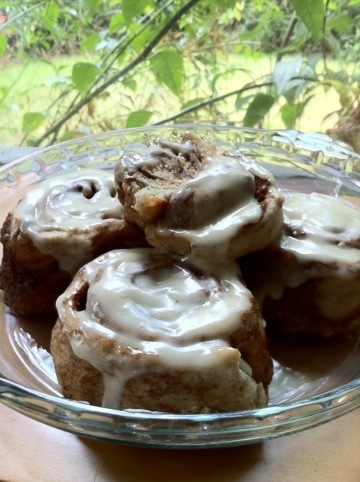 a couple of times and liked them but how great to have a recipe to make them at home! Cooking with my kids was one of the things about parenting that I was most looking forward to, and while my two year old is still too little to do much beyond dump things in a bowl for me or mix something here and there, it really is as sweet as I remember it being from my own childhood.